My last post, “The Major Challenges Facing the United States,” came to the conclusion that, while the U.S. has many big problems to address, our national debt is the biggest problem of all, because it will be so hard to deal with through the political process. Our total national debt is now $19.9 trillion. The so-called public debt, on which we pay interest, is $15 trillion, or 77% of GDP, the highest it has been since right after WWII. Furthermore it is predicted by the Congressional Budget Office to keep getting steadily worse, reaching 90% of GDP by 2025 and 150% of GDP by 2047 unless current policy is substantially changed. Right now our debt is almost “free” money since interest rates are so low. But when interest rates return to more normal levels, interest payments on the debt will skyrocket by hundreds of billions of dollars per year, likely leading to a new fiscal crisis, much worse than the Financial Crisis of 2008. The only sane solution to this humongous problem is to start shrinking our annual deficits, this year at about $685 billion, down close to zero over a period of several years. This will require a painful combination of spending curtailments and perhaps some tax increases as well. One possible way to accomplish this herculean task has been laid out by Barron’s economic journalist Gene Epstein, see here and here. Mr. Epstein’s plan would balance the budget in ten years by decreasing projected spending by $8.6 trillion, with 60% of spending curtailments coming from the entitlement programs of Social Security, Medicare and Medicaid and the rest from both military and domestic discretionary programs. It needs to be strongly emphasized that under the Epstein plan spending would not actually decrease from one year to the next, but would rather grow at a slower rate, from $3.9 trillion in 2016 to $4.7 trillion in 2026. His plan would decrease the public debt from 77% of GDP today to 58% in 2026. Conclusion. The U.S. faces the very unpleasant problem of excessive debt which will just keep getting worse and worse without making some relatively unpleasant adjustments in the way that the federal government spends money. The sooner we get started in this process the better off we will be. President Trump’s budget for 2018 presents a plan to achieve a balanced federal budget in ten years, by 2027. This is a highly desirable goal but there is much skepticism about whether or not his budget is realistic, see here and here. Fiscal restraint is a common sense necessity, and is not austerity. Our public debt (on which we pay interest) now stands at 77% of GDP, the highest since WWII, and will continue to increase without major changes in public policy. Right now the debt is almost “free” money because interest rates are so low. As interest rates inevitably go up in the near future, interest payments on the debt will skyrocket and become a huge drain on our federal budget and make annual deficits even worse than they already are. 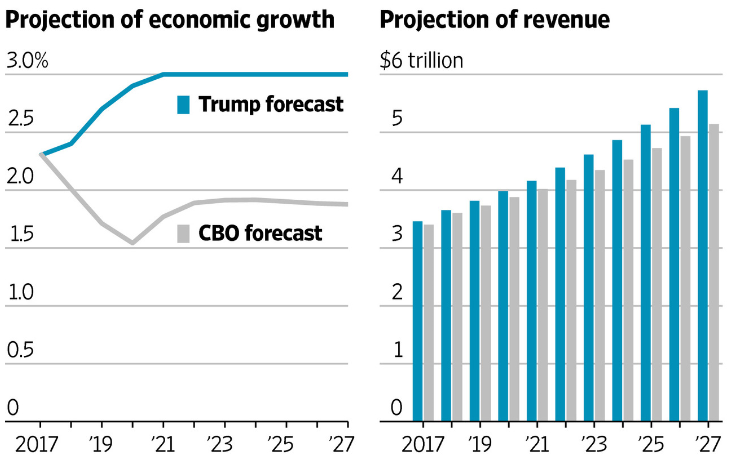 3% annual GDP growth, as assumed in the Trump budget, is almost certainly too optimistic. However the Trump Administration is on track to achieve significant deregulation and averaging 2.5% growth over the next ten years is doable. Insufficient entitlement reform is a big drawback for the budget. It will be very difficult, essentially impossible, to achieve and sustain a balanced budget without modifying Social Security and Medicare to make them self-financing. Turning Medicaid into a block grant program to the states would finally put Medicaid on a sensible budget. Requiring able-bodied welfare recipients to work is a good idea and is the basis for cutbacks in social welfare programs. The Departments of State, Interior, Education and Justice should be able to absorb cutbacks and operate more efficiently. Conclusion. There are many good initiatives built into the Trump budget. Unfortunately there are also some invalid assumptions and glaring omissions. It does not represent a bona fide plan to balance the budget in ten years but at least it recognizes the importance of doing so. Is Trump Serious about Shrinking the Debt? 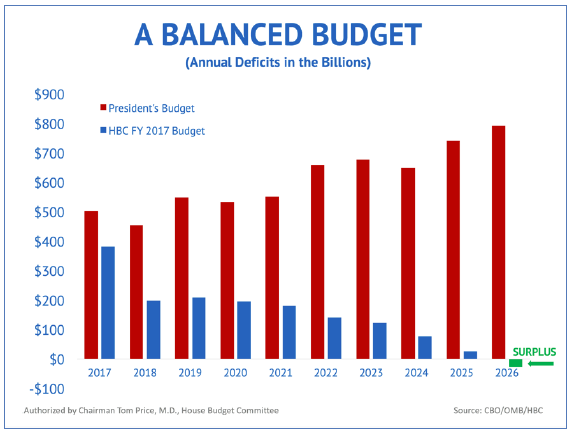 The newly released Trump budget for Fiscal Year 2018 claims that it will lead to a balanced budget in ten years. This is a highly desirable goal. However the projected $4.5 trillion in spending cutbacks for many popular programs, as well as the projected 3% GDP growth for the next ten years, are both unrealistically optimistic. Nevertheless, at least the Trump Administration is moving in the right direction. Prolonged deficits and mounting debt will undermine economic growth by interfering with investment in the private sector. Prolonged deficits risk fueling inflation as the government lowers the value of the dollar by printing more of them. High levels of debt held by foreign lenders put us at the mercy of foreign countries. The growing debt exposes America to greater “rollover” risk with the increasing reliance on short term debt which frequently has to be rolled over. Rising debt limits flexibility for increased spending in times of recession or other emergency. For example, when the Financial Crisis occurred in 2008, the debt level was just half of its current level. This meant the government could risk higher deficit spending in order to stimulate the economy. Deficits have an unfortunate tendency to feed on themselves. Our current deficit level of approximately $500 billion per year is so large that it can only be significantly reduced with great pain. The only possible way to make deficit reduction politically feasible is to spread this pain widely amongst the public as shared sacrifice. This will be very hard to do. Deficits and debt are grossly unfair to future generations who are stuck with servicing the debt and/or struggling to pay it down. Conclusion. The Trump Administration recognizes the strong need to get deficits and debt under control. Unfortunately its current budget just submitted is not a realistic plan to get this done. So says the Concord Coalition’s Robert Bixby. President Trump said in a recent interview on Fox News that he would like to have a balanced budget “eventually,” but not at the expense of higher spending for the military. The problem is, as Mr. Bixby points out, if we delay fiscal discipline in order to increase military spending, what else will we delay it for? Will we delay it for infrastructure spending or border security or tax cuts? Will we delay it to protect Social Security and Medicare? The Congressional Budget Office predicts (see chart) that, under current law, the public debt (on which we pay interest) will grow from 77% of GDP in 2017 to 89% of GDP in 2027. Furthermore, mandatory programs (Social Security, Medicare and Medicaid) will grow from 13% of GDP this year to 15.4% in 2027 while discretionary programs (everything else except interest payments) will fall from 6.3% of GDP today to 5.3% of GDP in 2027. Interest payments on the debt will grow from 1.4% of GDP ($270 billion) today to 2.7% of GDP ($768 billion) in 2027. Note that spending (outlays) is projected to increase from $3963 billion in 2017 to $6548 in 2027, which represents a 5% annual increase in spending every year. But also revenues (tax income) are projected to increase from $3404 billion in 2017 to $5140 billion in 2027. If spending growth could slow down from $3963 billion in 2017 to $5140 billion in 2027 (the projected amount of revenue in that year), the budget would then be balanced in 2027! It turns out that no budget cuts are required to accomplish this. 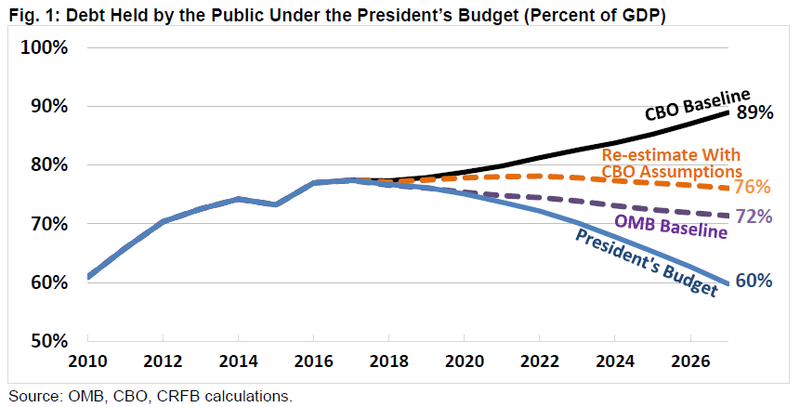 In fact a calculation shows that simply limiting spending increases to 2.6% per year (rather than CBO’s projected increases of 5% per year) is sufficient to achieve this goal. Conclusion. Above is outlined a plan to balance the budget over a ten year period without making any spending cuts! All that is needed is a modest amount of spending restraint! Speeding up economic growth, which has averaged an anemic 2.1% per year since the end of the Great Recession in June 2009. This will create the new and higher paying jobs that country so badly needs. Shrinking annual deficits, ideally down to zero, so that our huge public debt (on which we pay interest) will begin to decrease as a percentage of GDP over time. My last post compared the President’s proposed budget for 2017 with a proposal from the House Budget Committee. Basically the President’s budget increases both taxes and spending while the House budget keeps revenues at a steady 18.2% and leads to a balanced budget after ten years. 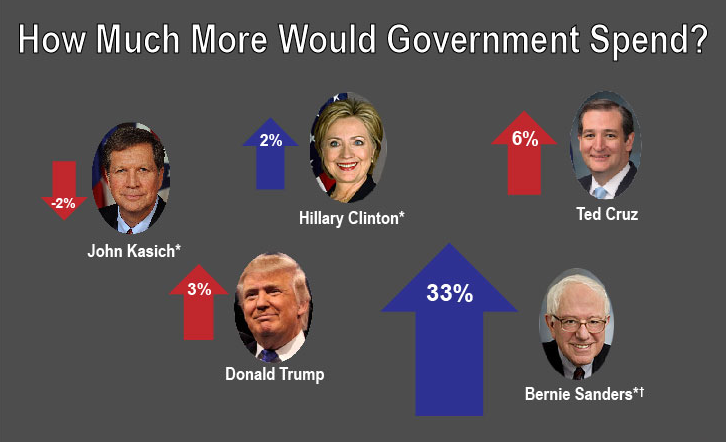 Only John Kasich would actually decrease spending over the next decade from 22.1% of GDP (under current law) to 21.5%. The other four candidates would all increase spending: Hillary Clinton (to 22.5%), Donald Trump (to 22.7%), Ted Cruz (to 23.4) and Bernie Sanders (to 29.5%). Mr. Kasich’s spending restraint would amount to a 2% decrease over current law while Ms. Clinton, for example, would increase spending by 2%. As I showed a year ago, reining in spending by 2% per year over current law is a major achievement and will lead to a balanced budget in ten years. In other words, Mr. Kasich’s spending plans are in sync with the latest House Budget Committee proposal. Perhaps this should not be surprising since Mr. Kasich served as Chair of this House Committee in the 1990s! Easy question: Which presidential candidate and which chamber of Congress are acting in the most fiscally responsible manner? In the midst of a tumultuous presidential campaign season, it iscommon for partisans of the left and the right to question the integrity, motives and values of those on the other side of the political divide. For example, the rise of Donald Trump in the Republican primaries has led some observers to declare that the Republican Party has lost its way and no longer has any sort of basic, coherent and broadly acceptable political philosophy. Economic growth in recent years has been much too slow and it should be a major goal of government to substantially speed it up. Our national debt is much too high and Congress and the President should be making serious efforts to balance the budget on an annual basis. The federal budget will be brought into balance over a ten year period. Devolving power back to the states. Prioritizing the responsibilities of the federal government and concentrating on the most important. Strengthening government functions that are critical to the health, retirement and economic security of millions of Americans. Such a budget plan as this could make an excellent first step towards an eventual bipartisan agreement that would address some of our country’s biggest problems. Instead it is likely to be ridiculed or dismissed by the Democratic Party as mere political posturing by the Republican majority in Congress. What could be a beginning to real progress on urgent issues will probably just be washed down the drain. After Two Years of Steady Job Growth, It’s Time to Bite the Bullet and Balance the Budget! For the past two weeks I have been I have been complaining about Congress’s irresponsible budget for 2016 and that we should now be pushing hard for a Balanced Budget Amendment to the Constitution. In my last post I make the case that a flexible BBA is compatible with economic growth and will, in fact, contribute to it once it goes into effect. In 2015 there was an increase of 2.65 million new jobs only slightly less than 2014’s 3.15 million new jobs, the two best years for job growth since 2000. The current unemployment rate of 5.0% is the best since the end of 2006. Although wage growth at 2.4% for 2015 is not as strong as the early 2000’s, wages have now been climbing 2% faster than price inflation for the past three years. 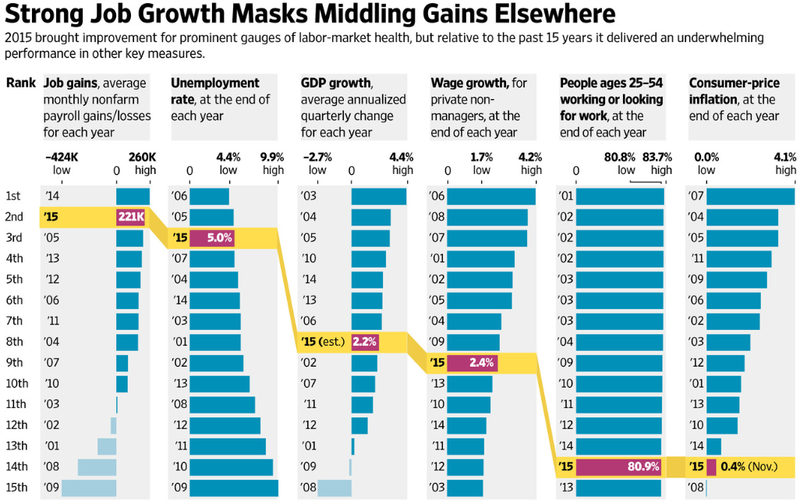 The offsetting negatives are a still slow GDP growth estimated at 2.2% for 2015 and a still very low labor participation rate of 62.6%. Conclusion: At some point in the very near future the government needs to stop spending far in excess of tax revenue. The sooner we recognize this the easier it will be to make the necessary correction. Our economy is the strongest it has been since the end of the Great Recession in June of 2009. Getting government spending in better sync with tax collections will be a big challenge and will not happen overnight. In fact, if a BBA is required to get the job done it will take several years to implement this route to fiscal responsibility. For all of these reasons now is the time to start moving on this gigantic and festering problem!